The bags are unpacked, the laundry is done, and the pictures from our cameras have been uploaded to our computers. Vacation is officially over. Andrew and I have spent the last 10 days seeing as much of Peru as we could fit in. The trip was a great adventure and I can’t wait to share more details in a later post (pictures and hopefully a Peruvian recipe to come). For now, I have a recipe for Homemade Apple Cider to share. Before we left for Peru, I made my first batch of apple cider ever and couldn’t believe how easy it was to make. If you have a bunch of apples and a bit of time, it’s a great treat for this time of year. The cider is made by throwing quartered apples (skins, seeds, and all) into a big pot with sugar, a couple of cinnamon sticks, and just enough water to cover. After boiling the mixture for an hour, simmering it for another 2 hours, and straining the mixture a couple of times, you have apple cider. It’s a simple and straightforward process that really brings out and concentrates the flavor of the apples that you use. I chose to infuse mine with just a bit of cinnamon, but other fall spices like allspice or cloves would be welcomed additions if you prefer a more heavily spiced version. I’m looking forward to testing this recipe out with different spices and varieties of apples. Hopefully, I can track down a nearby apple orchard and get some apple picking in before the season is over. If anyone knows a good place to go near Houston, let me know! The amount of sugar you need depends on the type of apples you use and how sweet you like your cider. I used 10 large Gala apples with 1/2 cup sugar and it was plenty sweet. 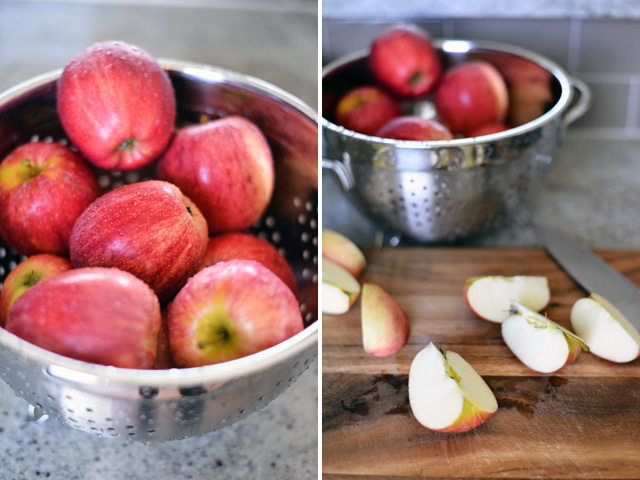 Cut the apples into quarters and toss them into a heavy 8-quart stock pot. Add enough water to the pot to just cover the apples. Sprinkle on the sugar and add the cinnamon sticks to the pot. Bring the pot to a boil over high heat, stirring occasionally. Continue boiling on high heat for 1 hour with the pot uncovered. Then cover the pot and simmer on low heat for 2 more hours, checking and stirring it every once in awhile. Take the pot off the heat and let the mixture cool. Once cooled, fish out the cinnamon sticks and use a potato masher or the end of a large rolling pin to mash up the cooked apples. Then strain the mixture through a fine mesh sieve, really squeezing as much juice from the pulp as you can. Repeat the straining process a second time to eliminate any excess pulp using either the fine mesh sieve again or some ultra-fine cheesecloth (I just use the sieve again). Store in an airtight container in the fridge for up to 7 days. 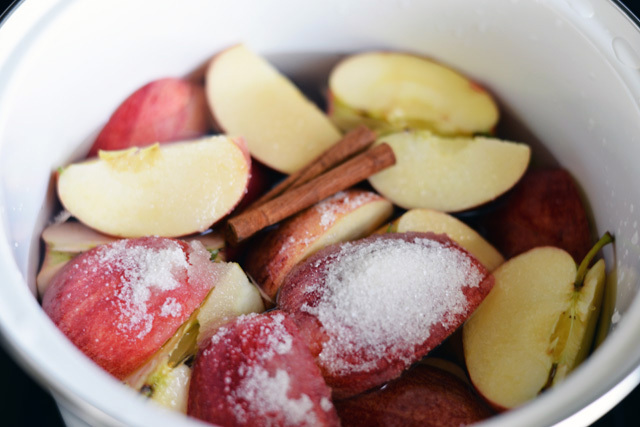 Serve it cold straight from the fridge or warm it up on the stove for hot cider. Makes about a half gallon of cider. Hi Sarah, thanks for stopping by. You have a lovely blog–love your pictures! Look forward to talking about food and travel with you at the meet-up next week! This looks absolutely gorgeous – comforting and autumnal and delicious! Wonderful recipe!!! 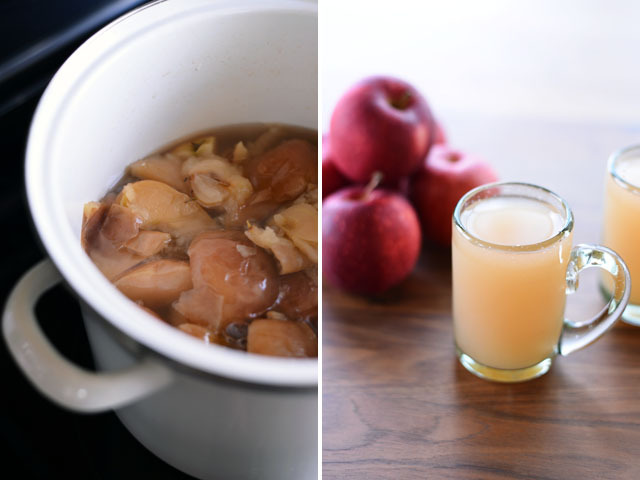 Thank you for sharing how to make apple cider at home! Perfect for these cold autumn afternoons! This looks wonderful! I love apple cider and have never thought to make it myself. Thanks so much for the inspiration! 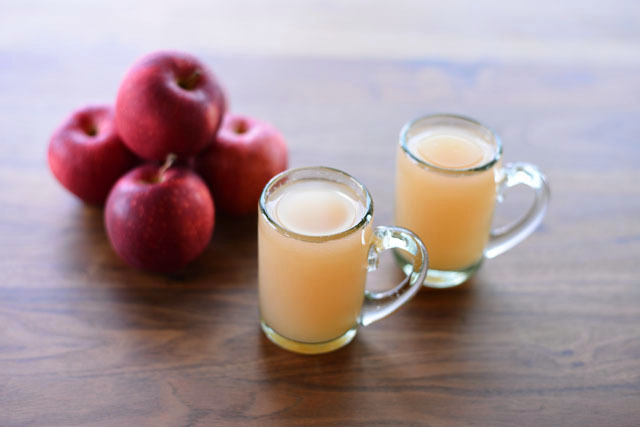 I’ve never tried to make cider but this recipe for homemade cider sounds wonderful! I’m an Irish bloke living and working in Peru as us Irish love our cider particularly bulmers we feel hard done by that we can’t get it in Peru but hey den da breaks so on the back we have decided too have a goo at making our own have you any advice and the big question is does yours have an alcoholic content . Hi Paddy, there is no alcohol in this cider recipe–I’m sorry! Apple cider in the US is generally non-alcoholic and we call the stuff with alcohol “hard cider,” which I have never made before. Wish I could help! Good luck with the cider-making!